We chose the Main Salmon for our Raft trip in Idaho. 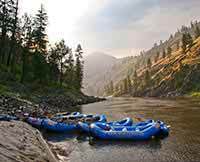 We had a group of 15 friends that experienced the Main Salmon rafting trip in Idaho. I cannot imagine having 5 more caring, friendly, helpful and committed guides. Alison, Vance, Ryan, Austin and Zach were their names and they were absolutely great. The meals were great, and the transportation was well coordinated.